I first heard about Yipin China while browsing through Time Out London’s website and finding about it there. While the Time Out rating gave it a 3 of of a possible 5 stars, the user reviews were much more favourable. I did some more research and found a review by Jay Rayner on the Guardian website and he loved it! As we love finding new places to eat (especially Chinese food) we thought we would give it a try. The website for Yipin China features their menu along with all the pictures of the dishes in glorious technicolour which enticed us even more us go along to eat. 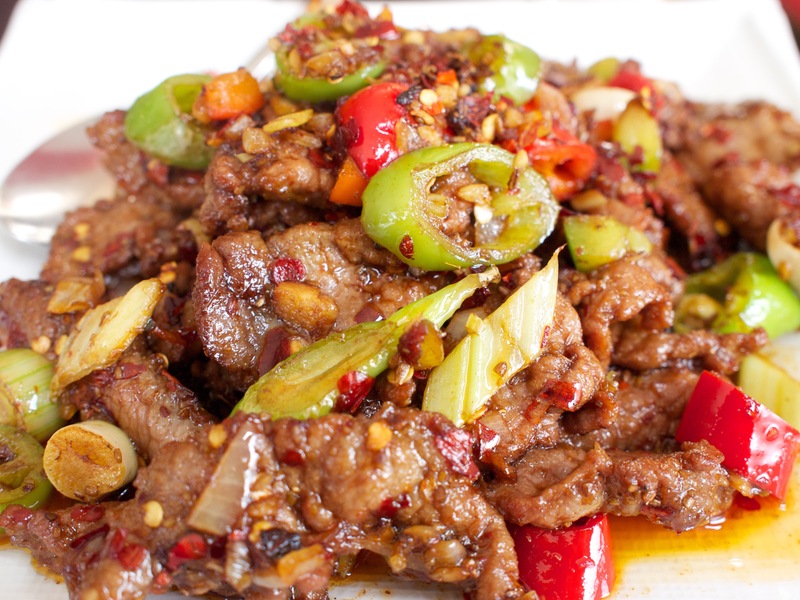 The restaurant serves traditional Hunanese, Sichuan and Cantonese dishes so there is plenty of choice for everyone. Be warned that some of the dishes are very spicy as they contain a lot of chilli. Do not let this put you off though as there are still plenty of dishes there that contain no chilli at all. The restaurant is located in Islington, London and is about 10 minutes walk from Angel underground station. We went along on a Friday lunchtime and were the first ones there. This was not a problem for us as we had a choice of seats and it also meant that we didn’t have to wait long for our food to arrive. We looked through the menu and all the dishes had a photograph of the dish next to it. This was both a blessing and a curse as we know what dishes looked good but the problem was that everything looked great. We finally settled on the Deep Fried Beef With Cumin, The Chairman Mao’s Red Braised Pork, Stir Fried Broccoli in Garlic, boiled rice for two and Chinese tea for two. The Deep Fried Beef With Cumin was delicious even though we found the chilli to be quite hot for our tastes. The texture wasn’t too chewy and even though it had a lot of chilli, the burn didn’t last long and you could still enjoy the flavours of the cumin and beef. The Chairman Mao’s Red Braised Pork was the star of the show. 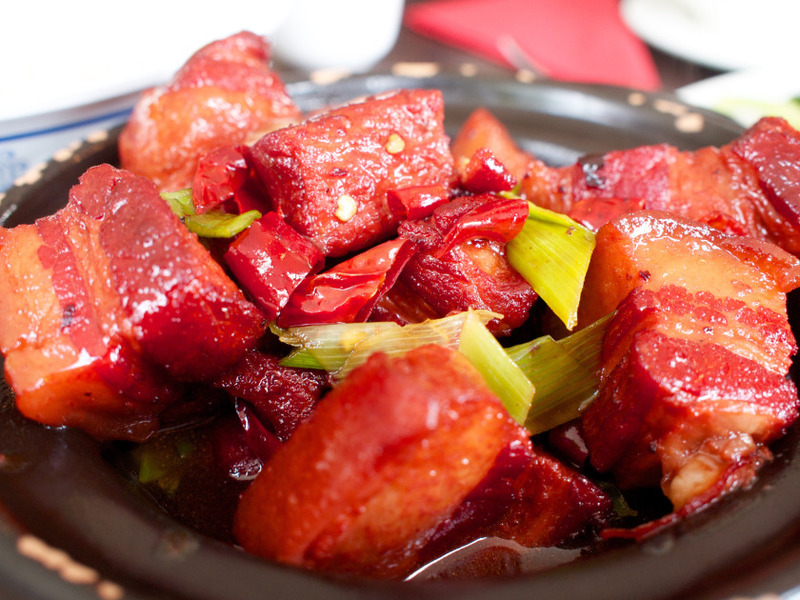 It is a slow cooked pork belly that has a subtle sweet aniseed taste and melts in the mouth. The colour of the pork is a glorious red that comes from caramelising rock sugar and then cooking the pork in it. It is one of the most tastiest dished I have ever eaten and I could quite easily eat this all day. The portion sizes at Yipin China are quite generous so you would normally order one dish per person plus rice unless you are really hungry. The service at Yipin China was friendly and not too obtrusive and our bill came to just under £40 including service charge. We will definitely be coming back for more of the Chairman Mao’s Pork and to sample some of their other mouth watering dishes.